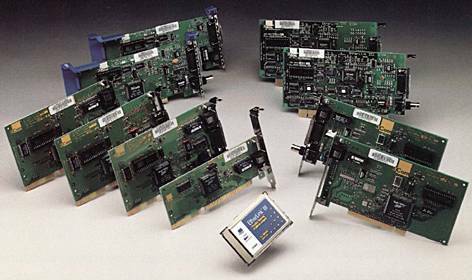 3Com network adapter cards are acknowledged leaders in all network environments including: Fast Ethernet, Ethernet, Token Ring, ATM and FDDI; for any kind of transmission media including: Unshielded Twisted Pair (UTP), Shielded Twisted Pair (STP), Coaxial Cable (thin & thick) and Optical Fibre. The EtherLink III and XL families of network adapters delivers the superior performance of Parallel Tasking architecture to P.C.s with ISA, PCI, MCA, EISA and PCMCIA buses. Extensive Compatibility means that you can count on the fullest range of Ethernet software support in the industry. 3Com's AutoLink auto - installation software automates installation and configuration tasks. For optimal reliability at low cost, all EtherLink components are integrated into one ASIC. Furthermore, 3Com backs all EtherLink adapters with a LIFETIME WARRANTY. Copyright ©1997 ZCM Services, Australia. Last updated on July 20, 1999.